National Chairman of APGA, Victor Oye, and other leaders of the party, during the launch of its national campaign in Anambra, on Thursday. The national chairman of the All Progressives Grand Alliance (APGA), Victor Oye, says the party will bring Nigeria back to God after recording success in the 2019 elections. 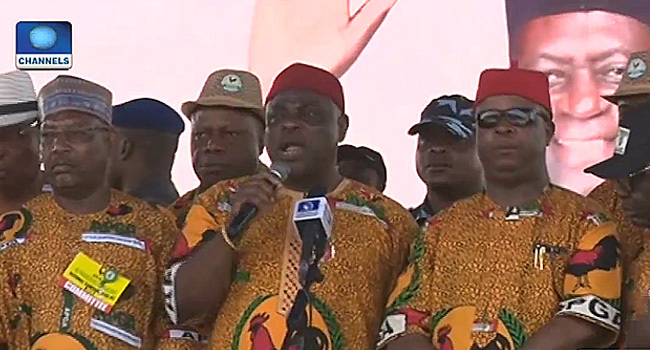 Oye said this on Thursday during the launch of the party’s presidential and National Assembly campaign at the Alex Ekwueme Square in Awka, Anambra State capital. He added that the party is presenting competent candidates that can transform the nation. “APGA is presenting a formidable duo. Two men that have the capacity, physically and mentally to transform this country. APGA is serving you a beautiful buffet. Buffet of integrity, a buffet of dexterity, buffet of performance. “What we are going to do at the national level is a replica of what Governor Willie Obiano has done in Anambra State. “We are going to focus on Agriculture, security, human empowerment and above all, we are going to bring back Nigeria to God. Without God, there is nothing we can do. God is the foundation of APGA,” he said. Oye also noted that the presidential candidate Major General John Gbor is an experienced scholar with integrity. Former national chairman of the party, Victor Umeh also at the campaign said APGA is ready to attain victory in the 2019 general elections. He added that the party is a progressive party that is not in support of marginalisation. “We promise the people of Nigeria what they need to be happy. Any party that fights marginalisation is a progressive party and that is the party everybody should look out for in this forthcoming 2019 general election. “We are here to represent this great party in this battle. It is a battle and we are prepared to carry the armour to the field and do everything possible to return victories to our party across the country,” he said. The campaign was attended by other top dignitaries of the party including Anambra State governor, Willie Obiano.